Before Passengers even began shooting, it was clear that its two leads would be approaching their offscreen relationship a little differently than what we've seen in the past. Chris Pratt is happily married to Anna Faris, and Jennifer Lawrence is a self-described woman of the world who doesn't need a man holding her down. They are both seriously funny on and off screen, and they're two of the biggest goofballs Hollywood has ever seen. So, instead of promoting the movie with the kind of chemistry Brad Pitt and Angelia Jolie used to sell Mr. and Mrs. Smith, this pair is taking things in the completely opposite direction. Instead of playing to the old Hollywood cliche where Pratt leaves his wife for his co-star, they have decided to play up the 'we hate each other' angle, and it's been fun to watch. Over the course of the past few weeks, Chris Pratt has been on a personal social media campaign posting Selfies that awkwardly cut Jennifer Lawrence's head off in the photos, if not cutting her completely out of them altogether. 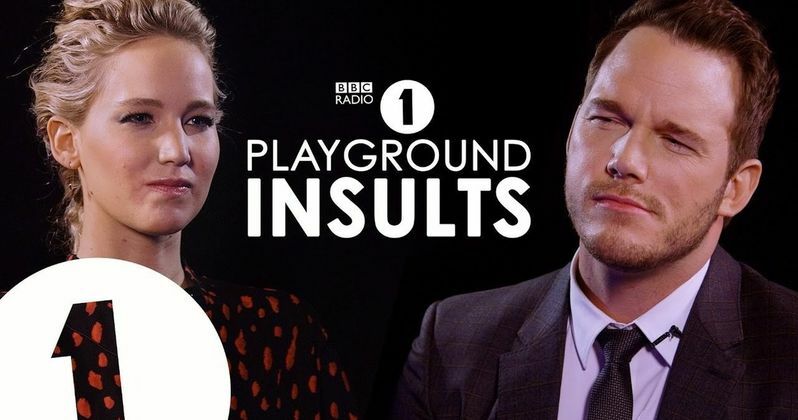 Now, the pair have appeared on Scott Mills' BBC Radio 1 program, where they brutally insulted and roasted each other with Playground Insults. And it's pretty funny. An example of a Chris Pratt zinger that stings? He says this about Jennifer Lawrence's thespian skills. But don't worry, Jennifer Lawrence isn't one to just sit and take such insults, and it becomes a heated battle to see who will win. Passengers doesn't arrive in theaters until December 21, but it looks like we'll get quite a show leading up to that movie's premiere. Lawrence offers this comeback in taking Pratt down a notch. And then the big Oscar guns are brought out for complete annihilation. Trust us, it gets a lot more brutal as these two really dig into each other and go for the jugular. The two stare each other down, and proceed to play nasty with each other's feelings as they wait for the other to crack. Neither actor ever breaks, though, and in the last heated moment, the gloves come off and it's no holds barred. That said, we're sure this is all done in fun. Passengers has the potential to be a big blockbuster hit this holiday season, though it arrives in a crowded marketplace. The movie is filling the void left by Gravity and The Martian over the past few years, a void that was also filled earlier this year with The Arrival. Smart sci-fi is back in a big way, and Passengers, whose script wound up on the coveted Black List, looks like another surefire winner. On a routine journey through space to a new home, two passengers, sleeping in suspended animation, are awakened 90 years too early when their ship malfunctions. As Jim and Aurora face living the rest of their lives on board, with every luxury they could ever ask for, they begin to fall for each other, unable to deny their intense attraction...Until they discover the ship is in grave danger. With the lives of 5000 sleeping passengers at stake, only Jim and Aurora can save them all. The movie is in theaters later this month. While we wait, watch as its two co-stars tear each other a new one.